Ingvild Deila had one of the most important roles in Rogue One, but you’ve probably never heard of her. 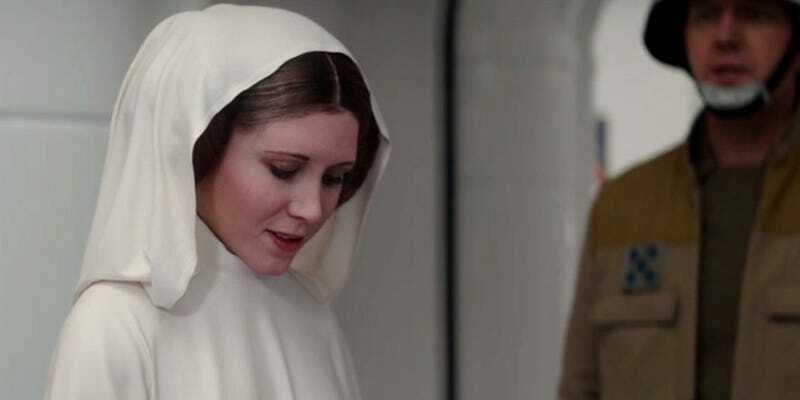 The Norwegian actress was the person on set whose face was turned into the young Carrie Fisher’s for the film’s climactic scene. While most Star Wars actors aren’t allowed to say much about the films, Deila was sworn to total silence—she couldn’t even say she’d been hired—but now she’s finally speaking out about the role. The UK-based actress just gave her first interview to journalist Jamie Stangroom. Here it is in its entirety but, we’ll discuss some highlights below. So if you didn’t watch the interview, Deila auditioned for the part without knowing what it was. She just was asked to speak for three minutes about something and be a specific size. It wasn’t until after she found out she got the part that she realized something was odd about it. She studied the scenes for a weekend, filmed it, and then waited 18 months for the film to be released before revealing it was her under the work of ILM. In the meantime, people were talking about the film, getting excited for the film, but she was the biggest surprise in the film. She couldn’t say anything. Stangroom asked Deila about the ethics of digitally recreating a famous actor, which was a big debate when the film was released, and she had a pretty even headed disposition about it. Of course, when Deila took the role, Carrie Fisher wasn’t dead. Deila was excited to hear that Fisher liked the performance but also admits, if Fisher had passed away earlier, she may have had reservations. There’s even more in the interview, including her thoughts on a potential Leia spinoff movie. You can see Deila when Rogue One hits digital March 24 and Blu-ray April 4.